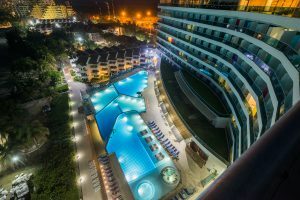 Stockholm – August 16, 2017 – Hotel Las Américas, a five star hotel located in Cartagena, Colombia, is further increasing onsite security with the installation of the Elsafe SENTINEL II in-room safes from ASSA ABLOY Hospitality in all 530 guestrooms at both Las Américas Casa de Playa and Las Américas Torre del Mar. Sitting on the shores of the Caribbean Sea, the hotel now offers guests an efficient and easily accessible in-room security option in addition to high-class amenities, leisure activities, onsite restaurants, a relaxing spa and state-of-the-art workout facility. After using a competing in-room electronic safe, Hotel Las Américas looked to ASSA ABLOY Hospitality’s Elsafe SENTINEL II because of its long battery life, ability to store and remember access events, safe depth, advanced futuristic design, and user-friendliness. The property has also successfully employed a mix of ASSA ABLOY Hospitality’s VingCard electronic locks with RFID technology and knew that quick and continuous customer support would be guaranteed for the installation of the safes, especially with an ASSA ABLOY Hospitality office based in Colombia. The Elsafe SENTINEL II is a functional, design-conscious and high security in-room safe that consists of a one-piece, cold-pressed steel door that is 70 percent stronger than a flat steel door. In combination with the revolutionary locking system ASSA ABLOY Hospitality is known for, the Elsafe SENTINEL II resists forcible entry and possesses anti-tamper labyrinths that protect the safe’s electronics from manipulation. Since the installation, the property has already seen significant improvements in maintenance efficiencies. Due to the safe’s ability to have its batteries changed without actually opening the safe and its long battery life, maintenance staff is able to cut down on the time it takes to perform this task and the frequency with which it needs to be done. The property is also saving money from cutting costs on battery replacement purchases. Additionally, in-room security is now greatly increased due to the Elsafe SENTINEL II’s ability to hold larger items, such as laptops, and properly store access events at the safe.